Are You Dying 2 Drive? Several young students were involved in a two collision outside Chesterfield College on Infirmary Road on Monday morning. Sadly, one lost his life - whilst others were treated for their injuries at the scene, with Fire crews, Police and Ambulance personnel battling in the dreadful weather conditions to free the teenagers for over half an hour. One arrest was made by police officers attending. 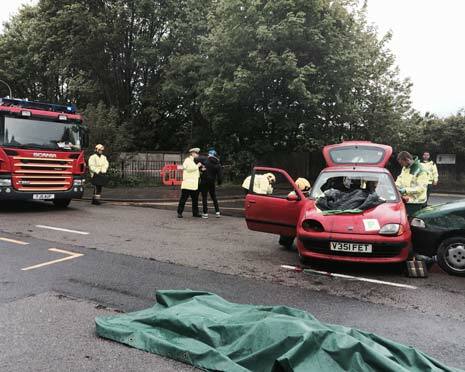 Actually, there was an accident on Monday morning, but thankfully, it was an exercise staged by the College, in partnership with Derby and Derbyshire Road Safety Partnership and other emergency services, to highlight the need to make safer choices when driving. It's a shocking statistic, but every year, around 150 young people are injured on North Derbyshire's roads - this does not include passengers, or other road users involved in collisions. Dying 2 Drive is an annual campaign run by Derbyshire Fire And Rescue Service to try to drive home the message to teenagers that they can reduce those figures by the choices they make when inside a car. To that end, 6 students played their part in showcasing this message by taking the roles of drivers and passengers of 2 cars. The emergency teams that attended were real however and dealt with what they saw as if it were a real incident. Hundreds of students and staff from the college watched on as the events unfolded. 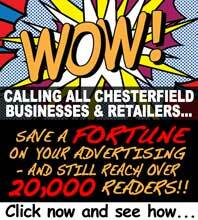 The Chesterfield Post spoke to many of those involved - firstly to Watch Manager Neil Porteous from Derbyshire Fire and Rescue Service who was in charge of the event. Neil told us just why this event had to be so realistic and what the key messages are for students, "What we do is we work with sixth form schools and colleges. The Fire Service has taken a lead on young driver safety. We do workshops throughout the whole day. These events show people what's involved and the injuries that can be sustained." And here comes the science bit - with Neil giving out some pretty shocking statistics, "The biggest killer of teenage girls in this country is being in a car driven by a teenage boy. "This time last year we'd had 3 fatal collisions, up to now this year we've had 18 already and we have the summer months to come! "It's people's driving standards, people don't drive to the conditions and drive with mobile phones." For those not able to witness Monday's demonstration, Neil had this message, "Just be mindful of your safety when you get into the vehicle. Think about who's driving or yourself. "Wear your seatbelt and put your mobile phone out of sight. If it rings get yourself in a position where you can pull over and answer it. People think it won't happen to them but it's happened to 18 people this year so far." 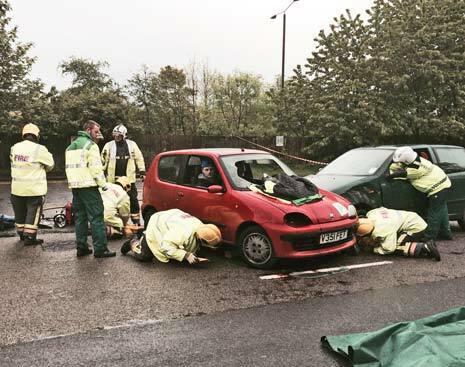 Tim Binns, Curriculum Manager for Public Services at Chesterfield College told us how vital an exercise like this is, "This is a demonstration to encourage the entire college and the young people who drive to associate the dangers of driving and being a passenger. "The Public Service students are marshalling and managing this event and it's good for the students to have a campaign to reduce the number of young people and get the number of casualties down and for the Public Services students to be assessed as part of the course, they're gaining valuable skills towards a future career. "We have directly run focus groups with students to touch on their views on road safety prior to the event - and we will now do those surveys again after the event." Jose Robertson is studying Public Services and hoping to become a Paramedic. 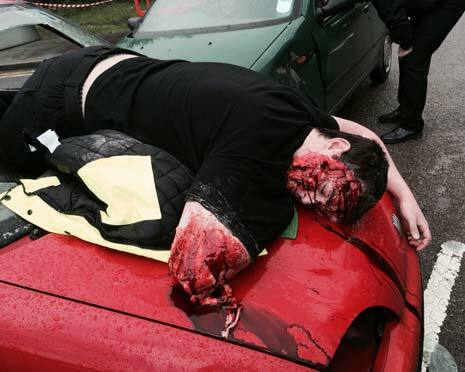 He was one of the students volunteering to be a 'casualty' of the crash (Jose is pictured below with full prosthetic make up after falling through the windscreen). He told The Chesterfield Post that the experience had made him think, "I felt it could be quite interesting; it took 15 - 20 minutes to get made up. The most important bit was when I was lying on the bonnet and I could see the Fire Service coming to me - that was the bit that had the most impact. "Professionally it helps you to know how the patient would feel, it's useful to put yourself in the skin of patients and to know a lot more. Personally, it shows you what could happen if you drink and drive or don't wear the seatbelt. "The professionals were excellent - when they took me out of the car I felt totally secure, didn't feel afraid at any minute." One of the professionals on duty at the scene, in dreadful conditions, was Tom Goddard, who was himself a Public Services student at Chesterfield College a couple of years ago. He said he was thrilled to come back and show what could be achieved, and also to help spread the message about safety in cars, "I learned techniques such as discipline and respect from my lecturers which has obviously followed on to my career in firefighting. I did volunteering through College and the Fire Service and if it were not for volunteering I probably wouldn't be here, it's a great way to get in as you learn. "These events are a great experience for those watching, it's good awareness as it's real - we went at it like we do a proper job. It's good for students to be here and see it. "I have just said to my colleagues that two years ago, I was where they were stood. If I can do it - they definitely can!"